Published: Apr 30, 2011 to ? 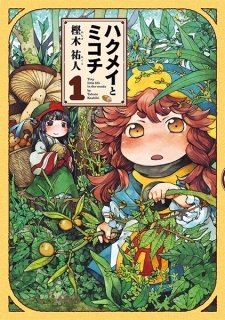 Hakumei to Mikochi has been licensed in English as Hakumei and Mikochi by Yen Press. It has been published in French by Komikku Éditions since February 15, 2015. Have you ever imagined it that you’re so small just like an ant when you’re in your childhood or even now? Well, this series has brought for you. Follow Hakumei and Mikochi, two girls who their body so small that live in forest below a big tree. It’s a warm story that tell the daily lives of these two girls, despite being so small, they can do a hard labor work like make a construction or even repaired it. They can even ride a small creature like insect to travel or help them to carry a heavy stuff, makes a relationship with others small being like them or another animals and solved a problems that coming caused their small bodies. With the current release of this in the Anime version, I've gotten curious about the Manga, and I have to say, it's just as great as the Anime. I feel so warm and cudddly with all the day to day stories about these two, fascinated by the world that the inchlings live in. There's always something for them to do and learn, while meeting characters with so much personality that aren't just one-off chracters; They will be seen again, which is a thing many stories forget about, and they don't need to put much effort into meeting up with them, all the side characters have their own lives that they live with so many activities of their own that aren't dependant on Hakumei and Mikochi. The level of detail in each scene really surprises me; It's a small but gorgeous world they live in, and the end-of-chapter tidbits really helps build it for you. From every feather and wing to the small grains of wood, it's quite beautiful and captures everything you love about art. My favorite part is how well the world's technology and magic even work together. There's Tsukumogami flying about, but there's also trains. There's a Necromancer, but there's also skyscrapers. It's so balanced and neat that it just blends well and you don't have it feel out of place. No one's slinging fireballs left and right while robots are walking about; It's more balanced between the two. If you want a Manga that will heal your sorrow; Pick Hakumei to Mikochi. If you want a Manga with a beautiful world; Pick Hakumei to Mikochi. If you want a cute Manga, pick Hakumei to Moikochi! It's such a wonderful series of plentiful stories and well-written setting and characters, that the best way to describe it would be just to read it!